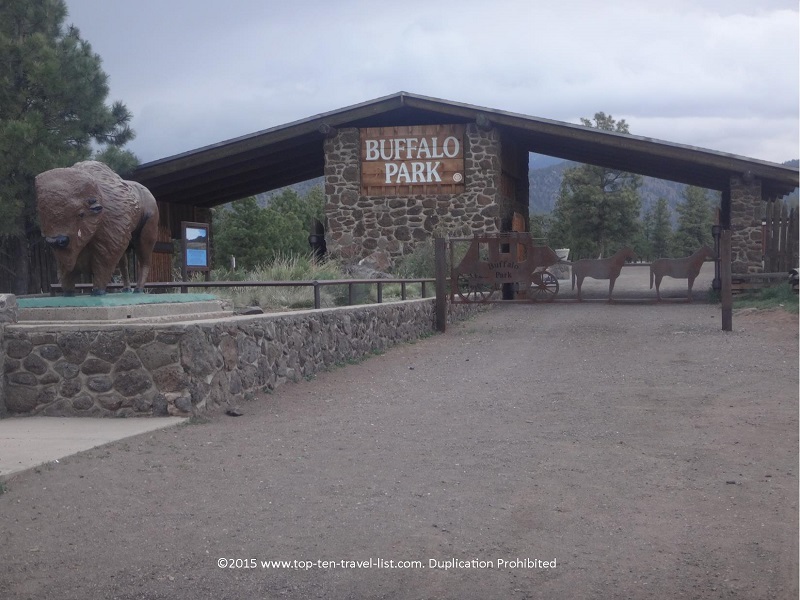 Buffalo Park: The Best Views of Arizona's Highest Mountain Range - Top Ten Travel Blog | Our experiences traveling throughout the US. 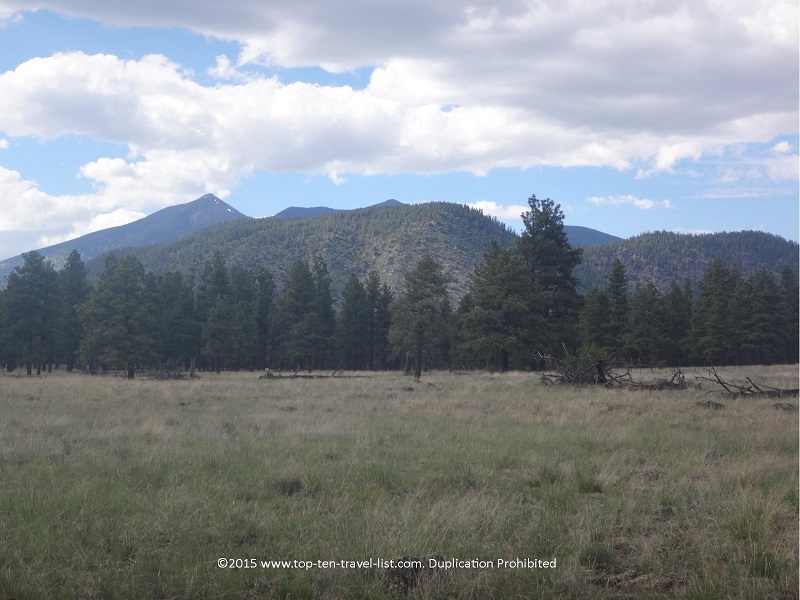 Beautiful Flagstaff, Arizona, a 4 season outdoor adventureland in Northern Arizona, is located just 7 miles from the San Francisco peaks. At 12,633 feet, Humphrey’s peak, the summit, is the highest in the state. The gorgeous mountains can be seen from several locations throughout the city. 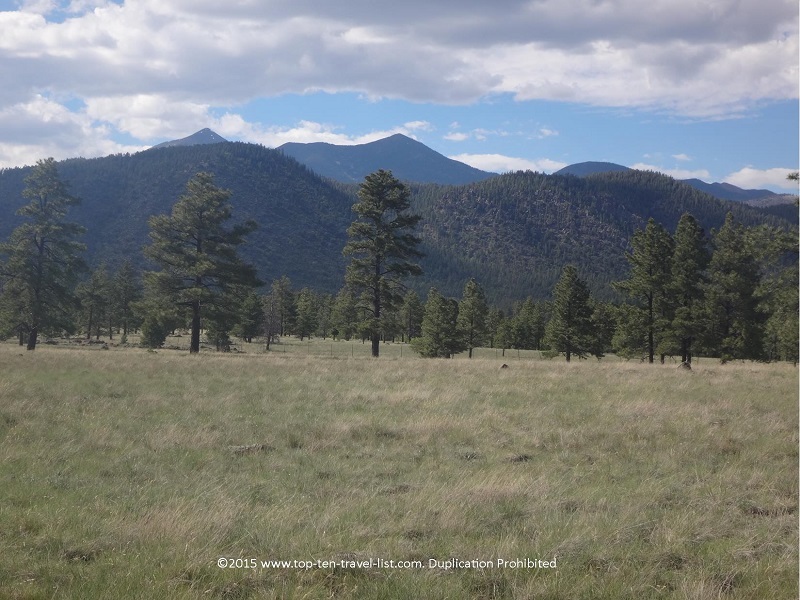 The town of Flagstaff is vastly different from the Arizona you are picturing. 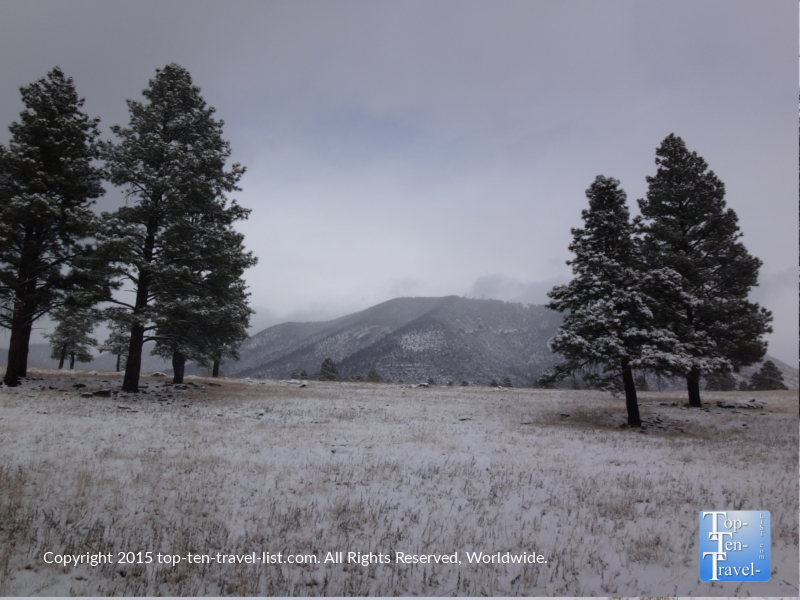 Snow capped mountains and beautiful ponderosa pine forest comprise the majority of the area. 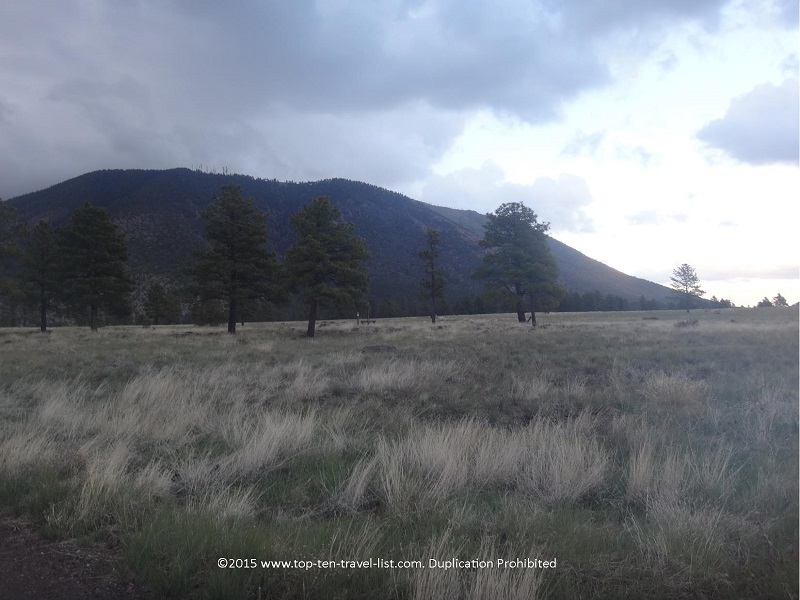 The high elevation (7000 feet) means cool summer temperatures when you need an escape from the brutally hot Phoenix summers, and lots of fun in the snow during the winter season (Flagstaff is one of the snowiest cities in the US, with an average of 100+ inches per year). 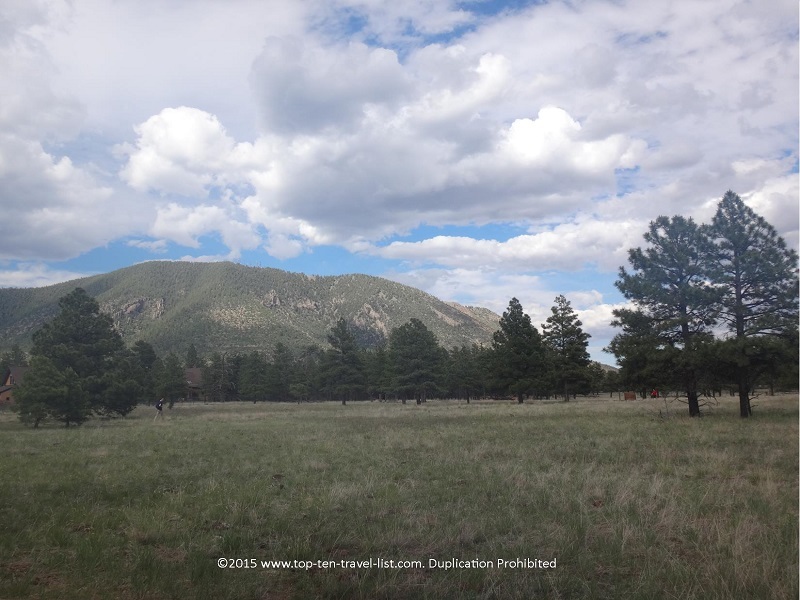 One of the best places in Flagstaff for enjoying these wonderful mountain views is Buffalo Park, a 2 mile loop on top of an ancient lava flow called McMillian Mesa. Back in the early 60’s the park ran as wildlife park, but was later turned into the beautiful recreational area which stands today. 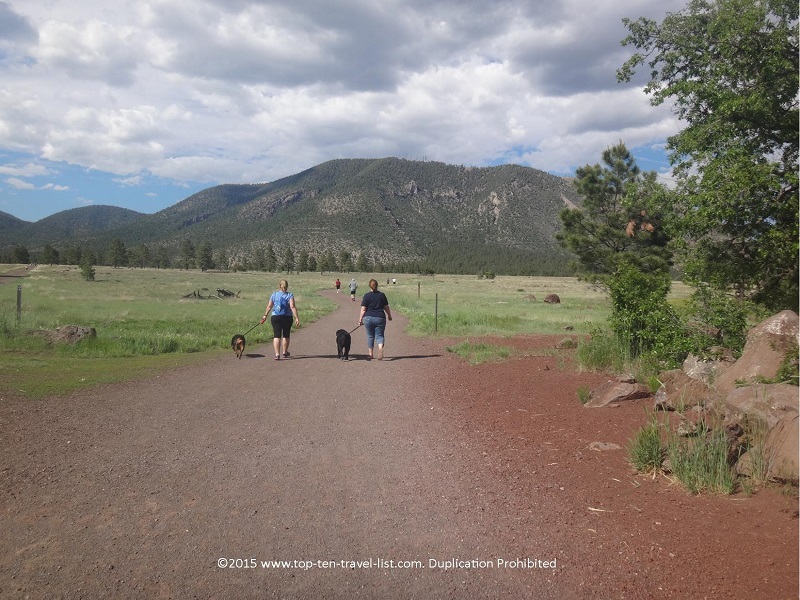 This beautiful easy trail is accessible to everyone. There is only one minor hill, while the rest of the trail is completely flat. 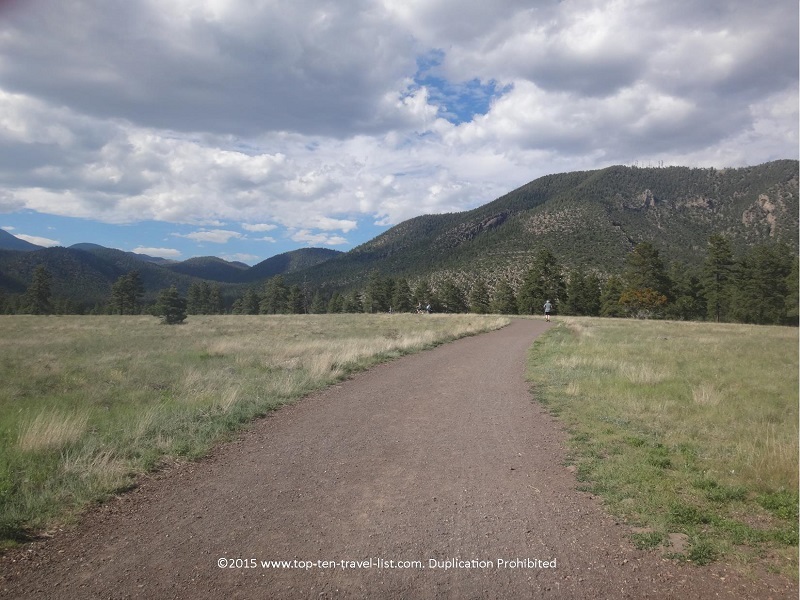 The trail is very wide, so it can accommodate large crowds (it is one of the most popular trails in the city, so it can get crowded at times). 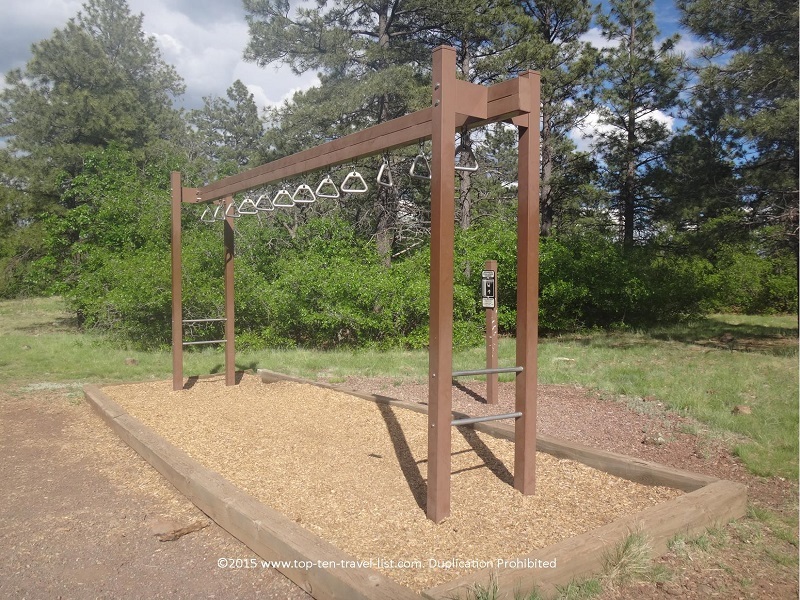 Along the way, you will find a variety of fitness trails if you feel like testing your aerobic and strength capacity. Working out is much easier when surrounded by such gorgeous natural scenery! The beautiful mountain views here can’t be topped anywhere else in the city. 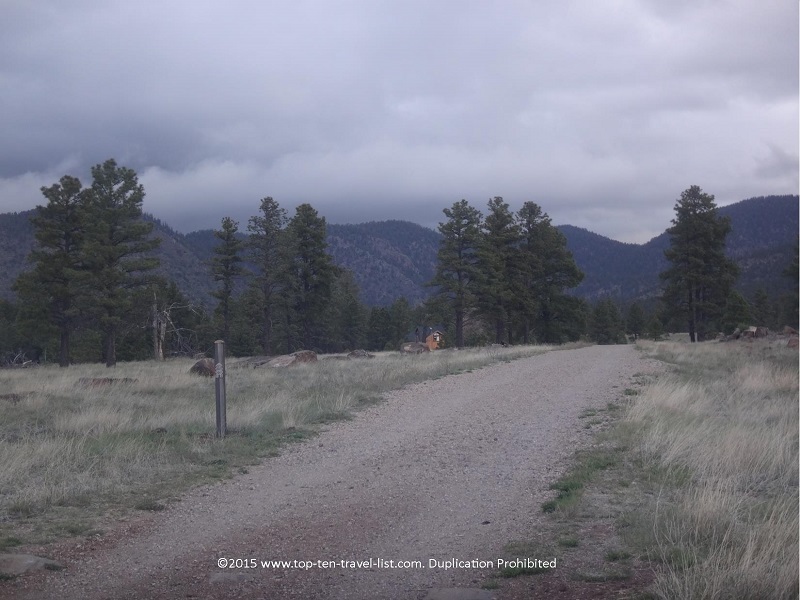 Although you can see the mountains while driving around town, it just isn’t the same as walking around the peaceful, beautiful loop at Buffalo Park. 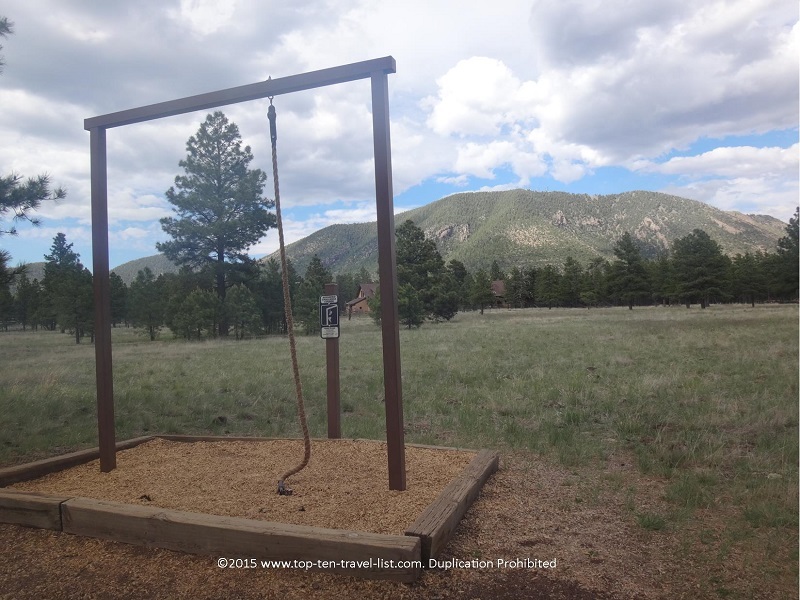 Here you will experience breathtaking panoramic views of the San Francisco peaks, Mount Elden, and the Dry Lake Hills. 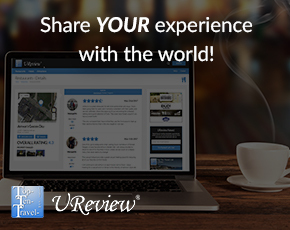 If you visit during the right time, you may be lucky and catch some wildlife. Along the way, the scenery varies from wide open grasslands to beautiful wooded land, all the time with gorgeous views of the mountains. 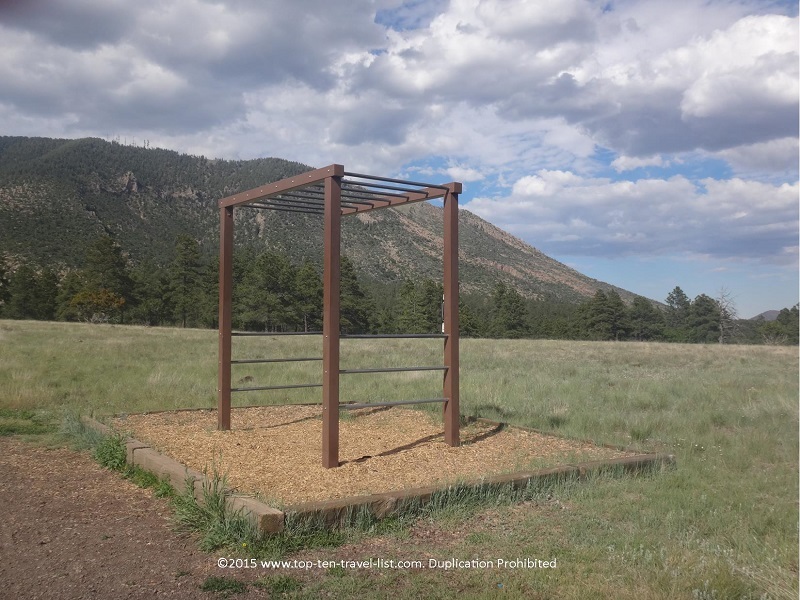 Summertime is a great time to get out there, get in some fresh air and wonderful views, while also getting in a moderate hiking or biking workout. Although only 2 miles, you can loop around as many times as you like to get in a decent workout. With views like this, you will want to keep on going longer. 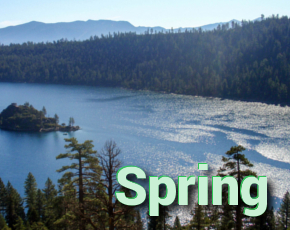 Biking and walking (leased dogs allowed) is best during this time, although the trail is beautiful any season. Before a summer storm, the dark clouds create some fantastic photo opportunities. After a fresh snowstorm during the winter, be sure to get out your cross country skis or snowshoes and enjoy the peace and quiet. 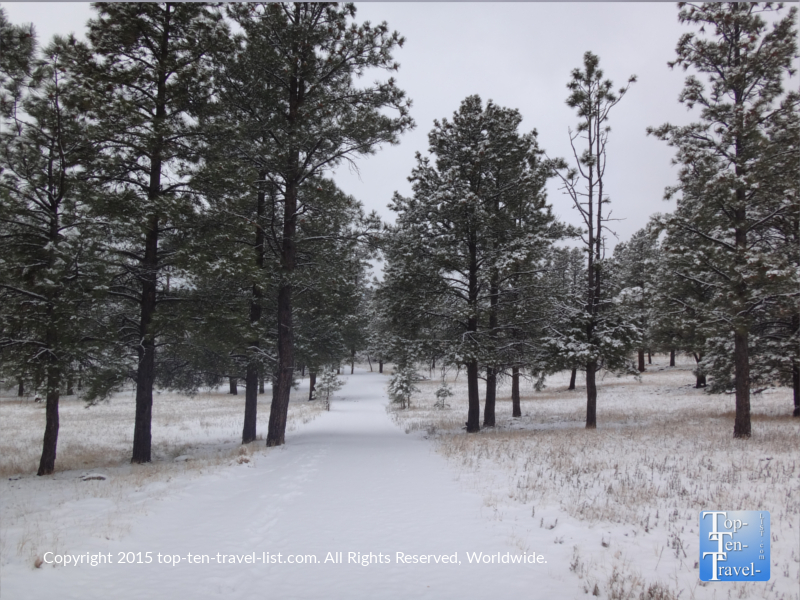 The mountains and pines look incredible when topped with fresh snow. It’s a true winter wonderland, especially for those coming from warmer climates who otherwise have no chance of seeing gorgeous snow. 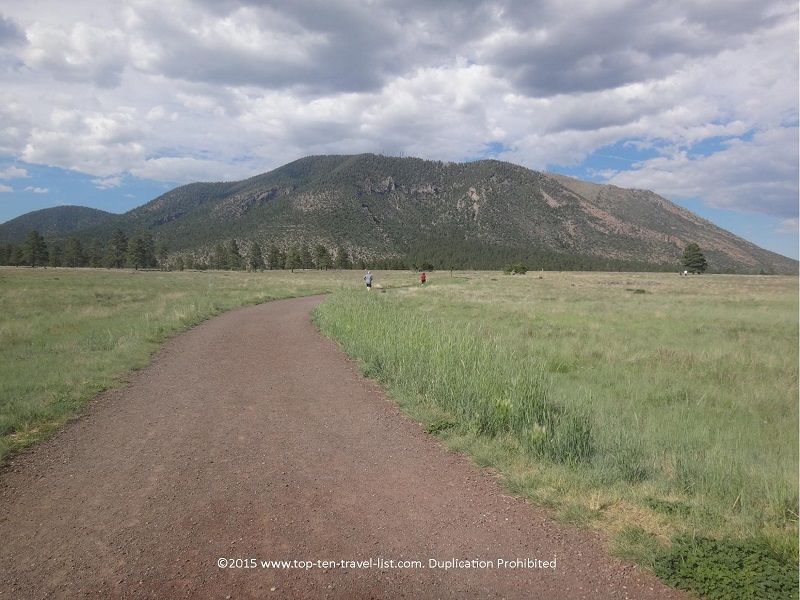 Buffalo Park is part of the Flagstaff Urban Trail System (FUTS), a network of 50+ miles of community trails spread around the city. 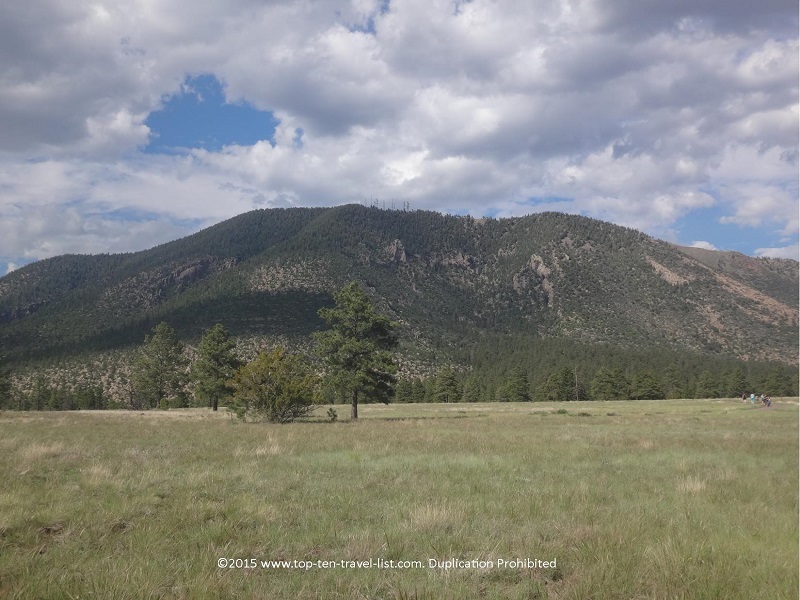 It is conveniently located just a short drive from downtown Flagstaff, making it the perfect stop before or after lunch. 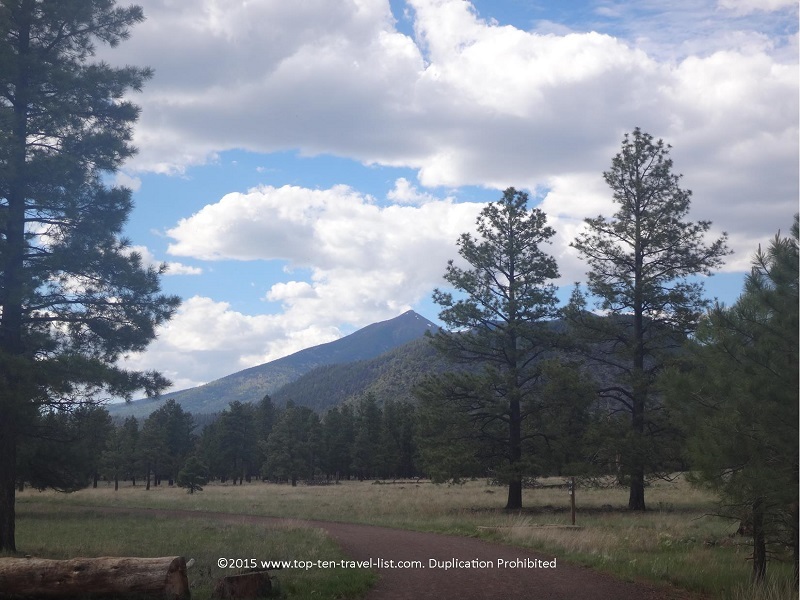 On your next trip to Flagstaff, be sure to take advantage of this beautiful, free park. 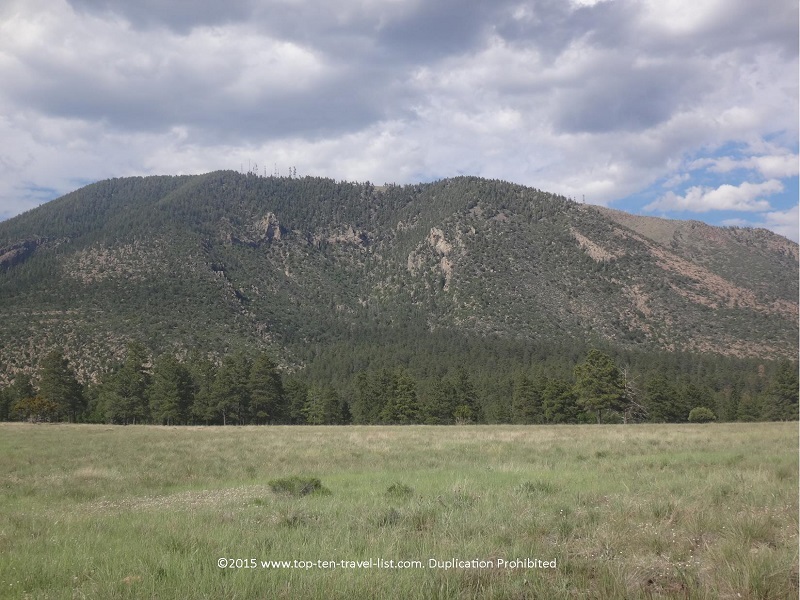 Anyone, from the fitness enthusiast to the casual walker, is sure to appreciate the beautiful scenery at Flagstaff’s most gorgeous natural area.